I couldn't come up with a good April Fool's joke for today. Darn. I don't think the kids really got into it either. Anyway....We got the report back from the inspection. We had to bring a few minor things up to code. We had to go buy three of these. 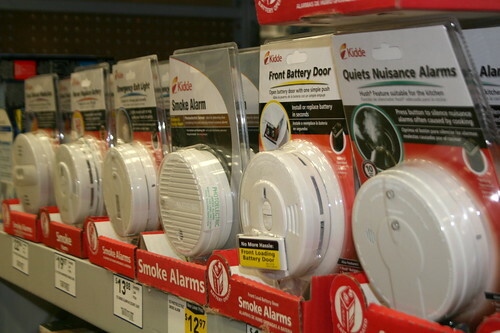 It is now code to have a smoke detector in every bedroom. So I guess the one that is in the hall, just 2-1/2 feet away from everyone's bedroom, is now obsolete. This evening Kade decided that he couldn't let the day go by without pulling a prank. We were coming home from driving by a house and he PUKED all over the back of the van. What a nice trick that was. Thanks to Mickey for cleaning it up. I'm still a little nauseous just from the smell.